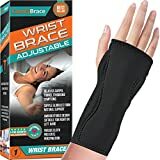 Carpal tunnel syndrome primarily affects those who have a jobs requiring a lot of wrist and hand movement (construction, computers etc.). This can potentially be compounded by a predisposing inflammatory process such as arthritis or medical conditions resulting in fluid retention/swelling. Carpal tunnel syndrome during pregnancy is a relatively common condition which occurs as a result of changes relating to pregnancy (fluid retention/swelling as noted above). Pregnancy may be the only time one may experience carpal tunnel symptoms or it can be a time when one with preexisting carpal tunnel can have an exacerbation of symptoms. What is important to understand before reading any further, is to know that carpal tunnel syndrome during pregnancy (if it occurs only during pregnancy) is rarely a persistent condition and almost always resolves after delivery. Furthermore, although the medical condition involves the nervous system, it is not a serious neurological condition as it is not the result of an underlying neuromuscular illness, genetic process or autoimmune disorder. Carpal tunnel syndrome is strictly an anatomical/mechanical problem which is remedied, in most cases, by simply immobilizing the wrist with a brace. Muscle weakness in the affected hand (grip strength), typically a symptom as the condition progresses if not treated. Radiation of symptoms up the arm (often most pronounced upon awakening in the morning). As the median nerve traverses the wrist, it is surrounded by tendons and bound by a fibrous “carpal ligament”. This ligament can be constrictive when swelling or inflammation occurs since this fibrous band does not expand to accommodate expansion of the tissues (whatever the cause of the swelling may be). Carpal tunnel syndrome during pregnancy occurs more often during pregnancy because the swelling, often associated with pregnancy, causes pressure on the median nerve. As discussed, any nerve that is subjected to pressure/compression is unable to conduct normal nerve impulses. Carpal tunnel syndrome is also becoming much more common due to the widespread use of computers/keyboards. For many the symptoms are mild: however, for some, the symptoms can be incapacitating, and may require surgery. In 20 Years of seeing many cases of carpal tunnel syndrome during pregnancy, it is important to not that there was not one patient that required surgery. The most advanced situation in my clinical practice required steroid injections to get relief during pregnancy and after delivery the symptoms resolved completely. Though this is anecdotal information, it is mentioned to emphasized how rare carpal tunnel syndrome during pregnancy will actually require aggressive intervention. It is important to be aware that this woman did not have carpal tunnel syndrome prior to pregnancy. Though the symptoms of carpel tunnel syndrome are quite specific, it is imperative that the diagnosis of this neurologic condition be made by your health care provider. It can be necessary to rule out other neurological conditions that can develop similar symptoms. Only your personal health care provider, who knows your medical history and physical exam and can make an appropriate clinical decision about whether further testing is necessary. Once an accurate diagnosis is established a treatment plan can then be implemented (outlined below). Once carpal tunnel syndrome during pregnancy has been clearly diagnosed by your provider, there are simple measures that you can do to alleviate symptoms (aside from what will be advised by your provider). Rest your hands whenever possible. Hand elevation may help to reduce swelling. Avoid activities that are repetitive and make the symptoms worse. The onset and duration of your symptoms. Started during pregnancy, weeks, months etc.. Whether the symptoms respond to conservative treatment (immobilization). Significant progression of symptoms in terms of pain or muscle weakness. Immobilization with a wrist brace and observation. 1) The initial approach to treatment for carpel tunnel syndrome during pregnancy is immobilization of the hand/wrist. This is accomplished by simply fitting a properly-sized wrist splint specifically designed for the management of carpel tunnel syndrome. Fortunately, this treatment is very simple and most often is all that is required to alleviate the symptoms. How long one wears the brace is determined by whether there is restoration of normal hand function and if there is going to be recurrent exacerbations of the condition relating to one’s occupation or daily activities. 2) If immobilization of the wrist does not resolve carpel tunnel syndrome or if there is worsening of the symptoms, your prenatal care provider will consult (usually with an orthopedic practitioner) to see if there is a need to administer further treatment in the form of local steroid injections. Oral steroids have not been shown to be effective. Going to a consultant may seem like a drastic step and though not often required, the reason this is done is because nerve compression and associated numbness and weakness can lead to muscle atrophy weakening, not to mention that persistent symptoms often become more painful. The use of steroids is intended to reduce inflammation and swelling. 3) Lastly and very rarely surgical intervention may be necessary. This is reserved almost exclusively for non-pregnant patients (so long as the affected individual can get through the pregnancy with conservative measures). One reason for this is because the symptoms may likely resolve completely after delivery. This is mentioned hypothetically, as I have never seen this approach performed during pregnancy. One can see where severe symptoms might warrant this approach if pain or muscle weakness is not able to be observed and one is remote from delivery. Surgical intervention is now performed by either using the standard open surgical technique or endoscopic approach, which is becoming the preferred approach for many surgical procedures (appendectomy, gallbladder, pelvic surgery etc.) If this should be an option that is considered, be sure to find a physician who is experienced at this endoscopic technique. This applies to anyone pregnant or not, who may have to have the carpal tunnel surgically released. This highly recommended book has withstood the test of time! 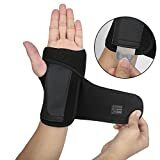 AMAZON REVIEW: Sharon Butler was working as a massage therapist and Hellerwork practitioner when she developed carpal tunnel syndrome and tendonitis. Unable to sleep through the night because of the pain and concerned about her livelihood, she built upon her knowledge of connective tissue and developed a series of stretching exercises to gently relieve the tension in her body. After daily stretching in this way, her pain soon subsided. To prove that these exercises weren’t just a fluke, Butler intentionally overworked her body to bring back her symptoms. While this may not have been the smartest move, her stretching program again relieved her pain. The magic behind her powerful exercises is their focus on fascial tissue. Fascia, which is stronger than steel, holds the body together. It wraps around muscle fibers, bones, and tendons. (If you’ve ever looked at an uncooked piece of chicken and noticed the glistening white layer over the meat, you’ve seen fascia.) In people who overwork their bodies, the fascia hardens, a natural response to prevent future injury. Unfortunately, this stiffness worsens with repeated insults to the body. Muscles, nerves, and tendons tense up and inflame even more and may even adhere to each other. Metabolic waste products can build up and become trapped instead of being carried away by the lymph system, and even more pressure is placed on the affected body tissues. Enter Butler’s exercises. The book is arranged to let you pick and choose the correct stretches to suit your needs. Too much typing, guitar playing, or gardening? Stiff neck, tingling fingers, sore upper arms, or all three? However you developed your repetitive strain injury and whatever your upper-body symptoms (or if you’re smart and you’d like to prevent such problems), there are multiple stretches in Conquering Carpal Tunnel Syndrome to suit your needs. The book is arranged to help users develop a personalized stretching program with more than 40 stretches for the upper body, forearms, wrists, fingers, and thumbs to choose from. Butler thoroughly explains the importance of stretching and the correct (and incorrect) way to do it, and the exercises are lucidly illustrated. 5.0 out of 5 starsIt is so unbelievably effective! This book has my highest recommendation. Unbelievable. This book is the best investment I have ever made in my health. The ultra simple concept of “stretch points” is a game changer. I am so happy I believed in the other reviews and bought the book. I saw results within a week of following the process. I do it every morning now. Easy and effective. If you have carpal tunnel problems… GET THIS BOOK. *** If you think you have carpal tunnel syndrome, it is important to have this evaluated by your prenatal care provider or your primary care provider to establish an accurate diagnosis and treatment plan. This article is intended to help you understand the condition and how to navigate the medical system to receive appropriate medical management.